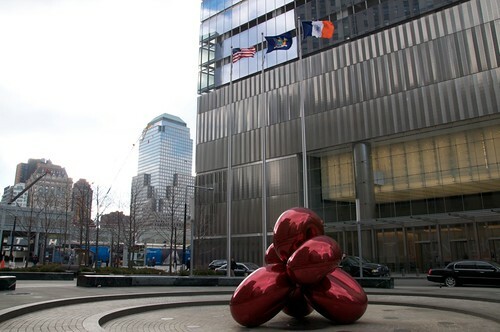 I knew that pop artist Jeff Koons had recently displayed some of his work on the roof of the Metropolitan Museum of Art, but being a New York 'newbie', I was unaware that this was out for all to see (since 2006, actually). It was fun to take pictures of it due to its wonderful reflective ability, even in today's dull light. 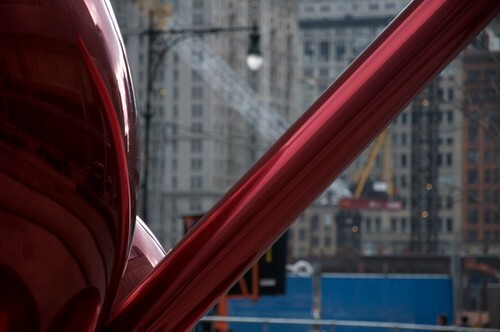 The juxtaposition between the balloon flower and the construction sounds of the World Trade Center site does make for an odd mix, however this cheerful sculpture brings a much needed lightness to the neighboring destruction/construction. If you haven't visited the World Trade Center site recently, you might be surprised by the formidable appearance of One World Trade Center. On Saturday, we joined hundreds of other people at Taste of Tribeca.